Juanita Ford, 91, went to be with the Lord on Saturday, March 17, 2007 at the Pavilion nursing home in Sidney, Ohio. She was born October 25, 1915 in Lima, Ohio to Arthur and Nellie Baughman. She lived most of her life in Lima, but in later years she lived in Las Vegas, Nevada, Phoenix Arizona and Sidney, Ohio. 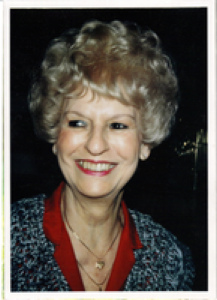 She is survived by her four children: Pat (Trisha) Sowards-Ford of Winter Haven, Florida; D. Vincent (Bud) and Marilyn Ford of Sidney, Ohio; Bill and Ruthie Ford of Alamogordo, New Mexico and Sandie Ford of Las Vegas, Nevada as well as twelve grandchildren and numerous great-grandchildren and great-great grandchildren. Funeral arrangements are bling handled by Salm-McGill and Tangeman Funeral Home. There will be no calling hours. A graveside service is being planned at the Woodlawn Cemetery, Lima, Ohio with Rev. Ben Hunt officiating. The service is planned for Tuesday, March 20, 2007 at 3:00 PM. Memorial contributions may be made to the Pavilion Nursing Home, 705 Fulton St., Sidney, Ohio 45365.